To prepare for the future trends in the house of worship market as it pertains to Audio/Video/Lighting (AVL) technology, one must glean insights from the past. There may be no better way to do that than to survey the technical staff of churches actively involved in AVL technical production, which was done earlier in 2016 by the Worship Facilities Magazine at their recent Worship Facilities Expo (WFX) conference, where 430 church tech staff responded to the survey. I find this particular data source compelling because, in full disclosure, I was one of the four founders of the progenesis of WFX and am a former advisory board member of this conference, the largest of its kind. It is with this healthy respect for WFX and the team at Worship Facilities Magazine that I share their survey data here and expound upon it to look towards future trends in the church market space. As I’ve written about the HoW market here on rAVe for over four years, I’ve shared dozens of articles that include scientific research, survey results and personal anecdotal stories to help paint a picture for the 300,000+ Protestant churches (specifically, this group does more with AVL than all other religious institutions in the U.S. by an exponential margin) for the manufacturers, distributors, resellers and consultants wanting to serve this vertical market. The survey data from WFX church techs reinforces much of what I’ve written about, but also provides some key insights into how and why churches are shifting their AVL technology decisions. To illustrate the veracity of the survey respondents and help you, the vendor, understand the credibility of these data points, it’s first important to point out that almost 30 percent of respondents have been with their current church for over ten years, while another 24 percent have been there for five to 10 years. These are not new, young guns with an over-eager viewpoint, but a consistent set of operators who have deep insight into their church AVL trends and pain points. Further, almost half of them are leading large teams of 10+ volunteers, with fully 6 percent leading 50 or more volunteers. In other words, this isn’t the sound guy at a small church sharing from a singular point of view. And, finally, over 38 percent of these respondents are at churches with a Typical Weekend Attendance (TWA) of over 1,000, while almost 37 percent have a TWA of between 251-999. In short, this data is right up the alley of manufacturers and systems integrators wanting to learn about this unique market. In addition to the survey results from the WFX conference, I’ve pulled in some of my key research stats that I’ve shared in other articles here on rAVe, to help further provide context and illustrate the growth trends of this oft-misunderstood and underestimated AVL vertical market. The growth of churches continues to increase while the AVL market hasn’t caught up to the increased demands that come from year-over-year growth. The opportunity is for vendors to enter into the high-growth world of churches heavily using AVL production and sell them the technology, training, and support they need to get in front of the growth curve. Full-time, part-time and volunteer tech staff want and need ongoing training. Church staff have high expectations for near-flawless technical execution week in and week out. Multiple services (and multiple venues) are now the norm, not the exception. Let’s break down each of these and see how vendors can provide the support these techies are requesting. Every professional worth his salt continues to hone his skills outside of each gig. From pro touring front of house audio engineers, lighting directors and video directors on the road pulling off concerts and events, the down-time in between is often filled with research and training. So it goes for church techs, who simply don’t have to travel to have the equivalent lifestyle of turning around a production every few days. The biggest difference is that in the touring world, the events don’t change all that much and the show is usually scripted to some extent. For this group, set-up, execute and tear-down is the gig. But for churches, while the structure is similar every week, the content changes, the staging changes and the content creation is also on their plates. Training is harder to come by for church tech staff when they’re not just responsible for the weekend, but also in generating the content and production tech setup in preparation for the weekend. Training can, and should, be sold to churches and positioned as a simple three-step process. First, these techs need mentoring in specific technical areas by a professional from your firm. Mentoring by a pro is the first step to sharpening the skills of church techs. By having a hired professional behind the console or in the booth, the opportunity to watch and train side-by-side helps with the real-world issues that happen with AVL technology in almost any venue. Second, use shadowing as the next phase of training. Guiding a church tech staff member through the process of honing a technical role, initiating her slowly through the ropes and giving her a lot of freedom to watch and observe your professional contractor allows the church tech to focus on learning and not on operating. By partnering your hired professional with the church tech staff members, the de-mystifying of tech and technique is a big part of breathing life and confidence into them. Your professionals have more experience in a wider variety of situations and venues to pour into these church tech leaders. Third, your professionals should then teach the church tech staff to ‘train the trainer’ so that the knowledge and helpful tips and best practices are codified and passed on to their other staff and volunteer base. In the classic ‘train the trainer’ scenario, your pros should be contractually required to spend time teaching the soft skills of how to teach, not just what to do. A continued need is for training to be offered in more ways through more vendors than ever. 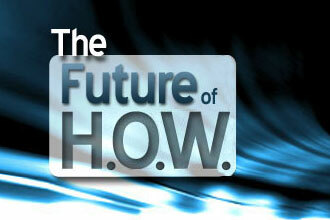 It’s insufficient to host demos and teach a few sessions at trade shows. The need is immediate. The opportunity is imminent. How will you respond? It’s one thing to pull off a technically flawless church service; it’s quite another to do it multiple times per weekend. And yet, that’s exactly what’s required in almost 85 percent of the surveyed churches. 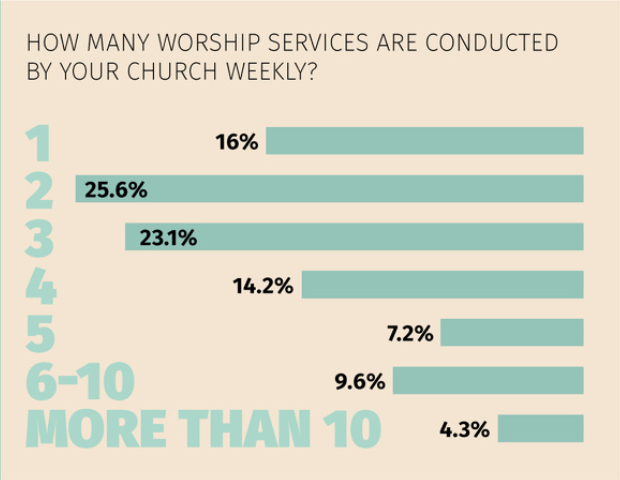 In fact, this little bar graph visually represents that number of weekend services for these churches. Practically speaking, more training should be focused on how to identify the pain point of the user. This will have less to do with the technical issue and far more to do with the impact of the issue on that user. For example, an amp failing is not about the configuration, but on the impact from the needed outcome; in this case, services are interrupted until this is fixed. That’s a huge pain point, and the vendor (and manufacturer reps) need to be taught how to “hear” the client and not just listen to them. By identifying the pain of the user and articulating back to them the technical impact, the solution will not only remedy the solution, the attention to the customer’s personal needs and fears will likely keep the brand from reputation damage. When you make the user the hero, your product wins. In turn, your brand wins. And when your brand wins, you win. That’s the power manufacturers and systems integrators have, and it should be brought to bear upon the HoW market. The opportunity to become a leading brand and voice in the church market is open to any vendor, regardless of company size or market share. This is a wide open field where those willing to learn the church space, engage with the church technical staff and empower church leaders with the opportunity for consistent and reliable services every weekend will grab more market share faster than ever before. What trends do you see in the HoW market? Share your views and opinions in the comments below. See also How Long Until the Future? Next Next post: Managing The Second Screen. And The Third. And Everything Else.